The Eden Local Plan branding is receiving very positive feedback from Eden District Council. 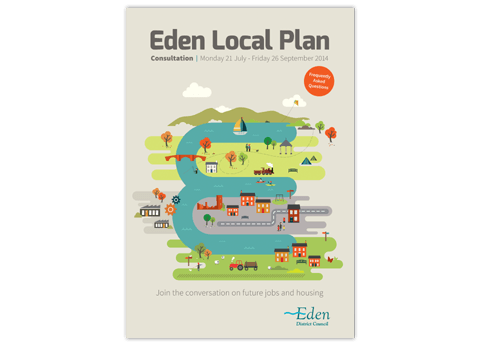 The Council’s brief was to make the Eden Local Plan more engaging and to encompass issues such as housing, transport infrastructure and jobs. The Eden Local Plan covers Eden District for the years 2014 to 2032. The branding launched the Local Plan ahead of public consultations throughout the District. Public engagement is essential in order to ensure the council is making the right decisions for the future of the District. The illustrative approach meant the branding could be Eden specific and highlight the Local Plan’s main focus. Eden’s bridges, lakes and castles are all featured in the illustration along with sandstone houses, factories and roads. The river Eden is part of the Council’s branding and is a focal point within the District. The river forms the letter ‘E’ for ‘Eden’ and this is at the centre of the artwork; depending on the usage, the ‘E’ can be used on its own, as a simple logo, or as part of the illustration.